In March 2010, Mary Ellen Cunningham and Pamela Crouch, both cancer survivors, met at a breast cancer support group. Encouraged by friends after her diagnosis, Mary Ellen had turned to photography as a way to use art to help her cope with the challenges of her diagnosis and treatment. Pamela, previously a professional writer, had been struggling with depression after chemotherapy left her aphasic and unable to work. She decided to try a new way of being creative, and began making birdhouses, painting the roofs bright pink and gifting them to newly diagnosed breast cancer patients. The women recall their first meeting: "[Pamela] bounced up to Mary Ellen and said, 'I used art as therapy, you used art as therapy, I'm sure there are others who did that too . . . let's put on a show!'" Seven months later, in October 2010, Living Proof Exhibit had their first show at Bucktown Center for the Arts in Davenport, Iowa. A month later, the newly formed non-profit organization began offering their first art therapy classes, and they have been hosting annual exhibitions featuring art made by other cancer survivors ever since! As a 6½-year breast cancer survivor I learned the journey does not end, there are many more medical issues to overcome. In September 2010 I retired, and in October I learned I had cancer. Painting relaxes and keeps me positive. I joined a decorative painting group, SMRDA, in 2007 and joined a painting class in 2012. The teacher is a dear friend. 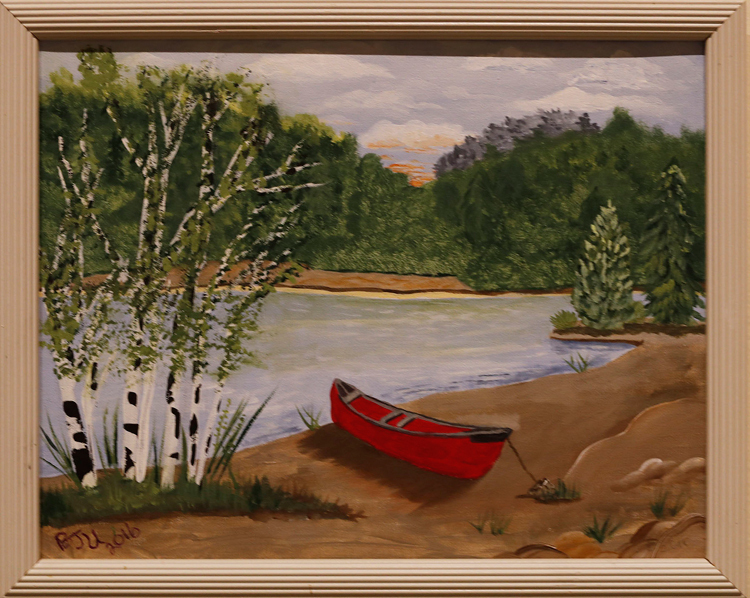 I also paint with my grandchildren and other family members, which provides quality time with each other. I am blessed with many other supportive family and friends, I want to thank everyone. Especially pink sisters in Cancer Support Group, my sorority sisters, Dr. Knight, Wendy Hermanson, and Barb Park at Absolute Balance Chiropractic. They all provide encouragement, information, and love. Without husband, Mother, and children this experience would have been unbearable. Thank you everyone for caring and helping me survive.